Facebook has soon become a second home actually it's advancing more to be the first home for youth. And most important perspective to be at home is to stay secure. And so facebook offers several security features, such as login alerts and approvals, to help you add an extra layer of security to your account. You can also review and update your security settings at any time. Learn more about what you can do to keep your account secure below. Protect your password: Don't use your Facebook password anywhere else online, and never share it with anybody ( trust me, not even your boyfriend). Your password should be tough to guess. Avoid including your name, number or common words. Learn more about creating a strong password. Never share your login information: Scammers may build fake websites that look like Facebook and ask you to login with your email address and password. Always check the website's URL before you enter your login information. When in doubt, type www.facebook.com into your browser to get to Facebook. Learn more about avoiding phishing. Log out of Facebook when you use a computer you share with other people: If you forget, you can log out remotely. Don't accept friend requests from people you don't know: Scammers may create fake accounts to add you as a friend. Becoming friends with scammers might allow them to spam your Timeline, tag you in posts and send you malicious messages. Never click suspicious links, even if they appear to come from a friend or a company you know: This includes links on Facebook (ex: on posts) or in emails. Keep in mind that Facebook will never ask you for your password in an email. 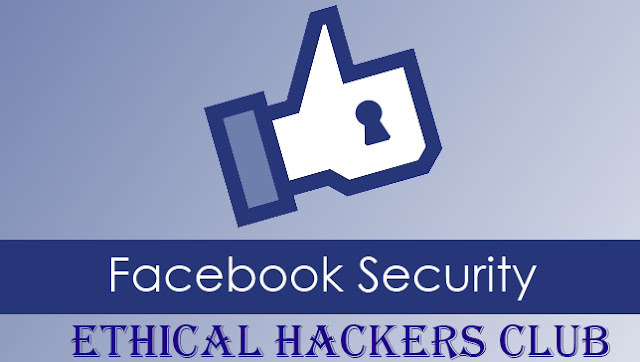 If you see a suspicious link on Facebook, report it to Ethical Hackers Club or Facebook. Use facebook's extra security features, like login alerts and trusted contacts: If you're logged into Facebook on a computer, you can use Security Checkup to review your security settings. Use Security Checkup to review and add more security to your account. Note: This feature is currently available to people logged into Facebook on a computer or the latest version of the Facebook for Android or Facebook for iOS app. 2. Use Facebook's extra security features. And, of course, stay on top of the latest security measures by following me on Twitter, and ‘Like’ us on Facebook.